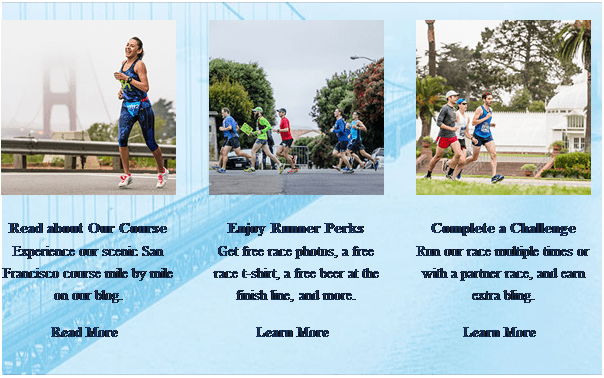 While it seems like a long ways off, for those fairly sure that they’ll run the SF Marathon or one of the Half Marathons, the lowest price you’ll see on this arguably expensive race expires tonight. It’s our hometown race, and while I find the full marathon to be a challenge, I still enjoy doing one of the halfs, particularly the second half. So sign up if you’re so inclined, and use the money you save toward a new pair of running shoes! Our best prices on The San Francisco Marathon’s 2017 events end tonight 8/29 at 11:59PM PDT. Whether you run a Full, Half, 5K or Ultra distance, register today and secure your spot in our historic 40th Anniversary celebration. See you on July 23rd! Register tonight and get in on our 40th Anniversary at our best prices! Copyright © 2016 The San Francisco Marathon. All rights reserved. Join us for our weekly long run 8:00 am Saturday, August 27 at Duboce Park! Join us for our weekly long run 8:00 am Saturday, September 3, at Esprit Park!